Each year Methodist College recognizes a DAISY Faculty Award recipient. The prestigious award recognizes exceptional nursing instructors. This year’s recipient received multiple nominations, from both students and faculty. The 2019 DAISY Faculty Award recipient is Brenda Mutchler, a nursing instructor at Methodist College. Students say that Brenda teaches them to have empathy, compassion, flexibility, critical thinking, and many more attributes of an excellent nurse. They also say that Brenda demonstrates all of these qualities to clients and students. Each nomination speaks to her dedication and willingness to go above and beyond to give students excellent learning opportunities. She provides students with diverse clinical experiences that will better prepare students to be exceptional nurses in the future. She continues to learn and develop opportunities for students, such as the newly developed Rural Health travel course. Brenda is always seeking ways to build her knowledge of academics and leadership. The nominations received speak to her kind nature and enthusiasm for teaching and nursing. 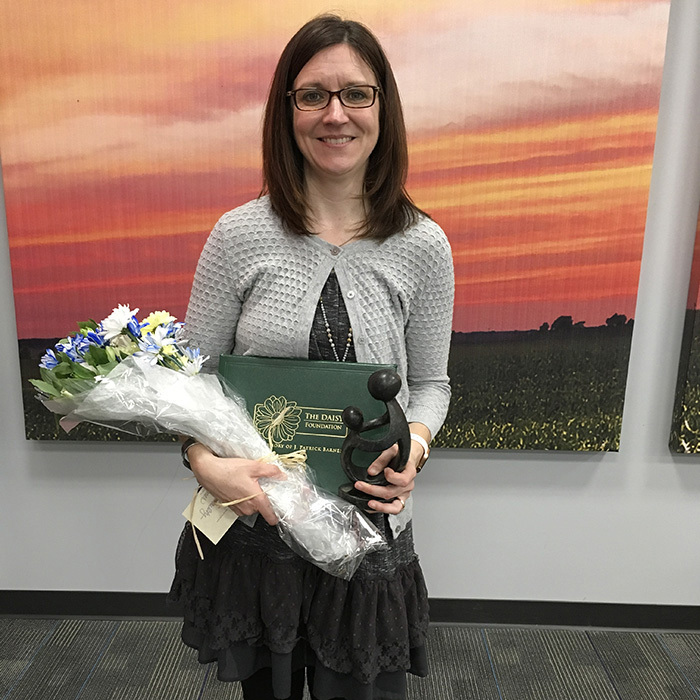 Brenda is a role model who lives the values of Methodist College and demonstrates the characteristics of a DAISY Award recipient. One student even wrote that they were sad when Brenda’s class ended for the semester. Faculty hear from students how much they enjoy her courses. Brenda is inspiring students through learning experiences every day. On campus Brenda is involved in a variety of committees including curriculum and student development. She stays involved on campus and in the community. Methodist College is proud to have Brenda as a faculty member and alum. Congratulations Brenda! The DAISY Foundation is an acronym for Diseases Attacking the Immune System, the DAISY Foundation was established in 1999 in memory of J. Patrick Barnes who died at the age of 33, from complications of an auto-immune disease. Patrick’s family was very touched by the remarkable compassion and clinical skill demonstrated by Patrick’s nurses during his illness, so they created DAISY to recognize exceptional nurses everywhere. The DAISY Foundation is dedicated to saying thank you to nurses.